Don't spend your time doing work a well-trained monkey could do. Even if you've never written a line of code, you can make your computer do the grunt work. Al Sweigart (Albert Sweigart) is a software developer and teaches programming to kids and adults. 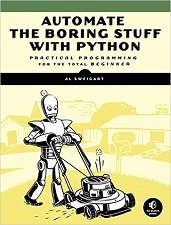 He has written several Python books for beginners, including Hacking Secret Ciphers with Python, Invent Your Own Computer Games with Python, and Making Games with Python and Pygame.